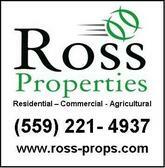 Ross Properties is a real estate company offering their services usually for commercial purpose. This family owned and operated real estate company provides exclusive services since Gerald D. Ross founded it in 1962. Their portfolio includes warehouse, strip malls, luxury estates, resorts, commercials, hotels located in different locations in Florida and Michigan. They usually offer their commercial for rent or purchase. Their full service hotels are equipped with advanced facilities such as high visibility as well as banquet facility, bar, meeting room, restaurants, exterior corridor, and pull sports bar located on site. They offer their customers an exciting opportunity to find the details of their properties online. There are currently 0 consumer reviews about Ross Properties available. Share your review. Please take a note that you are about to post a public review about Ross Properties corporate office on CorporateOffice.com. This review will be public, so please do not post any of your personal information on this website. If you would like to contact the corporate offices of Ross Properties, please use their contact information such as their phone number, website, and address listed above to contact them. However, sometimes staff from Ross Properties headquarters do read the reviews on this website.